Today, Catholics and many other Christians celebrate the feast of the Assumption of the Blessed Virgin Mary. This significant feast day recalls the spiritual and physical departure of the mother of Jesus Christ from the earth, when both her soul and her body were taken into the presence of God. contained the Pontiff's accounts of many longstanding traditions by which the Church has celebrated the Assumption throughout its history. The constitution also cited testimonies from the early Church fathers on the subject, and described the history of theological reflection on many Biblical passages which are seen as indicating that Mary was assumed into heaven following her death. Eastern Christians have also traditionally held Mary's assumption into heaven as an essential component of their faith. Pius XII cited several early Byzantine liturgical texts, as well as the eighth-century Arab Christian theologian St. John of Damascus, in his own authoritative definition of her assumption. In Eastern Christian tradition, the same feast is celebrated on the same calendar date, although typically known as the Dormition (falling asleep) of Mary. Eastern Catholic celebration of the Dormition is preceded by a two-week period of fasting which is similar to Lent. Pius XII, in “Munificentissimus Deus,” mentioned this same fasting period as belonging to the traditional patrimony of Western Christians as well. 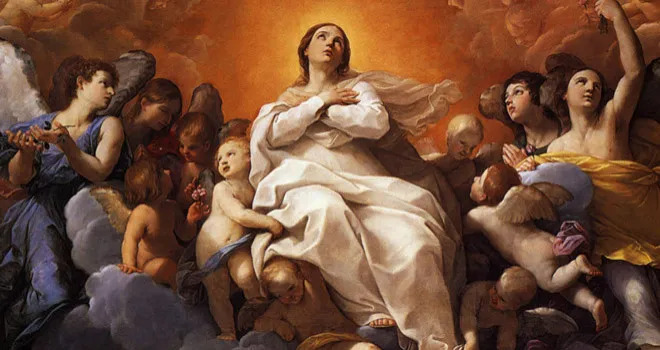 The feast of the Assumption is always a Holy Day of Obligation for both Roman and Eastern-rite Catholics, on which they are obliged to attend Mass or Divine Liturgy.